Recently (2015,) I’ve thought it’s perhaps better to think about painting in terms of it as an instrument rather than as a medium. Certainly I have thought about it as a medium a lot in the past. Some of my paintings (for example the Eisenstein paintings) derive almost entirely and certainly originally from formalist thoughts about what a painting is, and how it is. 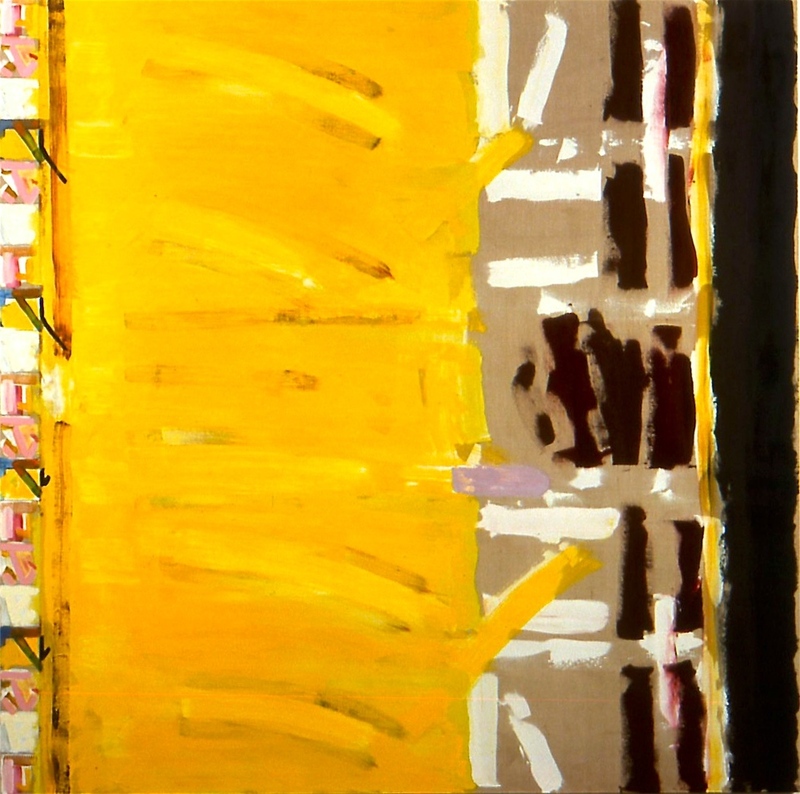 But for me at least, and perhaps more generally, I think thinking about painting in that way has become less helpful than it once seemed, because it is too historicist and causes the idea of painting to obstruct what actual painting—as image, object, space, surface—may do. That is to say, what a person is doing with painting as an historical idea and practice is not what it once was. What was a source of argument and speculation, is now more like one of belief and convention. Art history, and especially painting’s history, is now (believed to be) settled. A general feeling that comes next is more of every kind of what there is now is what we have, and while unsatisfactory in two obvious ways, what an artist gets painting to do in a particular instance seems a more fruitful question to pursue than the question of what comes next. This is because the question of what comes next is no longer one that can drive us, but it begs the question of what will come next. If it were not going to be done by us, why then would it be like more work done by us except that it won’t be done by us? And not only are others going to make it but also to look at it. The problem with a continuous present is that one way the present is defined is in relation to what has passed, including what seems not to have changed, so anything done now will be seen from another perspective than one possible now. I have suggested that to talk of concentrating (as artist or as either theorist or general audience) not on the medium and its historical role and identity, but on what a particular work is and is doing, is to distinguish between thinking of art as of the contemporary or as in the moment. It may be both (mostly is, maybe all has to be) but it makes a difference to which of the two one is closest when one begins. I didn’t put it that way at the time, having not had the thought consciously, but I think these paintings suggest it was already in my head fifteen or so years ago. All of them are the same height and slightly different in width. They’re as tall as Annie, my wife, so the height defines a space I’m become familiar with over the last forty years, and when I first had the idea of making them they were going to be more similar. That didn’t last long, I can’t really do variations on a theme. I want to exhaust the theme in one painting, and then do another painting on another theme. If another painting does something like the same thing, it will be in another set of terms that have to do with that painting in particular. The Eisenstein works are the closest I’ve ever come to making a series in the way that Frank Stella, say, does. I think Stella’s paintings are the best but I can’t work like that generally speaking, I could in the case of the Eisenstein series because there were several ways to think about the structure in relationship to what else went on in the painting. 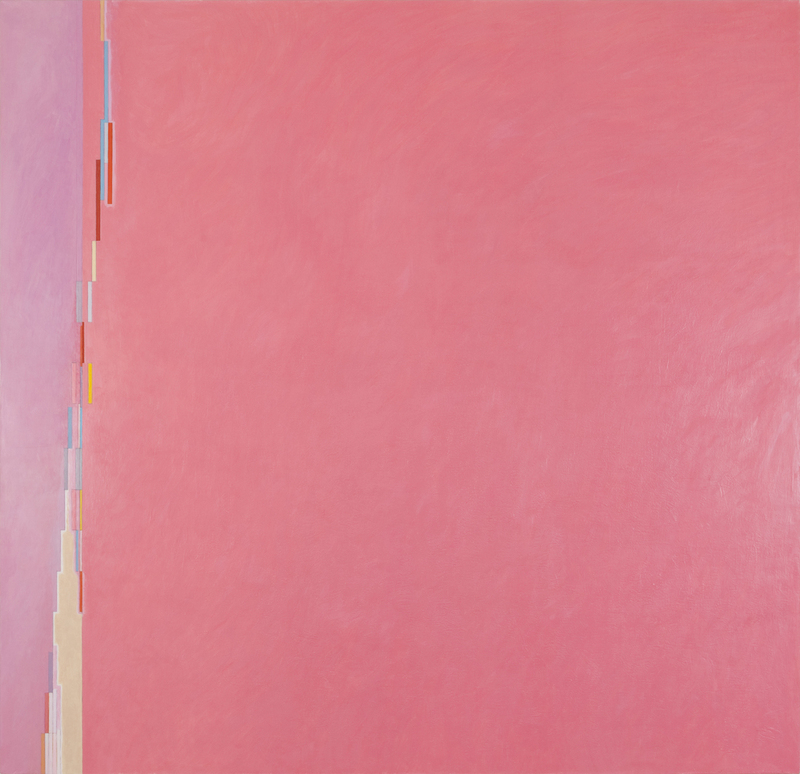 These ten paintings are a group that is more or less the opposite of a series as that’s normally defined. I had a bunch of money from a Guggenheim Fellowship, so I ordered all the stretchers at once, and then they all took on a different direction. Deliberate (Courbet) (2001) is called that because it’s made out of marks which are in my mind deliberate and certain from the start, and this is also why its title refers to Courbet, as I think that’s true of the way he works. I painted Giorgione Goes to Jamaica (Monet) (2001) using a plumb line’s shadow. I’d paint a vertical row up to the shadow, then move the plumb line and paint another, over and over of course. I got the color from Giorgione, and the limpidity of the painting’s space is indebted to Monet’s water paintings, I think; Annie had a red dress she wore in Jamaica when we were there years ago which also has something to do with it. Hottest Part of the Day (Cézanne) (2001) is called that because I was trying to get that kind of afternoon heat into the green. The reference to Cézanne has to do with the kind of cross-hatching I used to paint it, and I think the green is mostly his too. My son Cyrus says it’s like an underwater plant explosion. 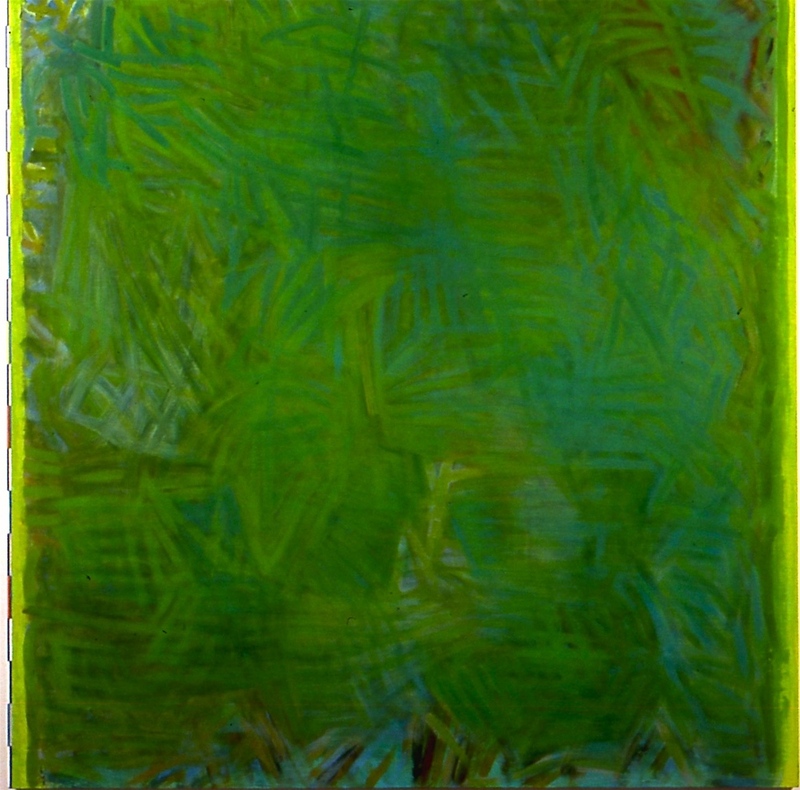 I think this is good, and when I think of the green I definitely think of an organic color, whereas when I think of the red in Giorgione goes to Jamaica I think of the color as that of a fabric as much as the color of flowers. I think this shows when they hang next to one another. 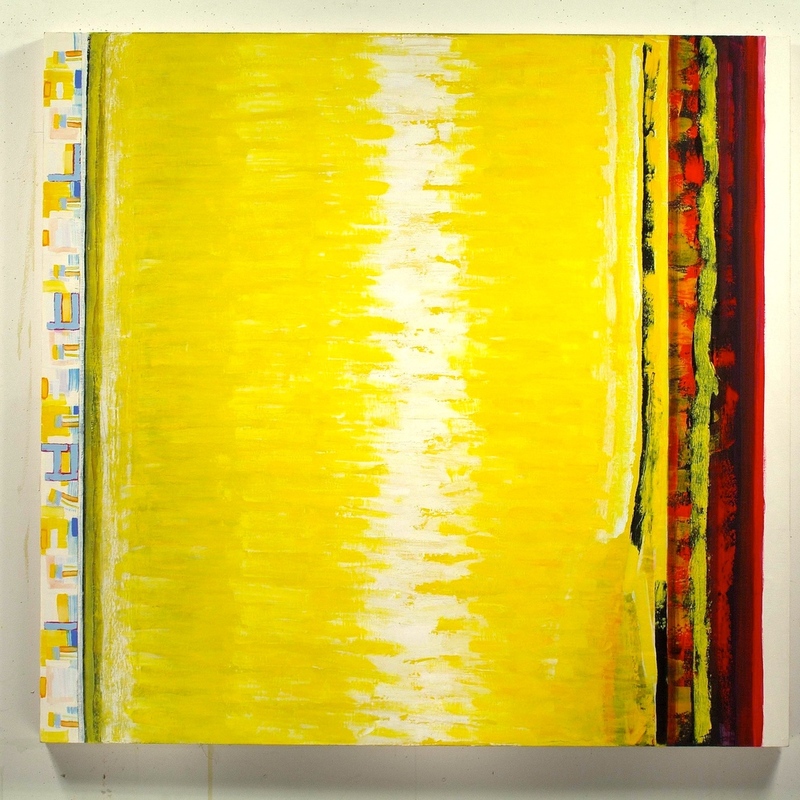 Impassivity with Space for Movement (2001) consists mostly of a complex yellow which goes from being slightly more lemon-yellow on the left to more cadmium-yellow on the right. Movement in it is very slow, you don’t see the change in color but you do feel it. It’s a very thick painting as a result of the way the color was developed. I think of it as being like the very deep sounds you can hardly hear in Beethoven’s piano sonatas. What happens on the left the result of the same color being applied a lot of times, and best appreciated if you look at it closely. The painting was damaged and badly restored, and currently awaits being restored again. 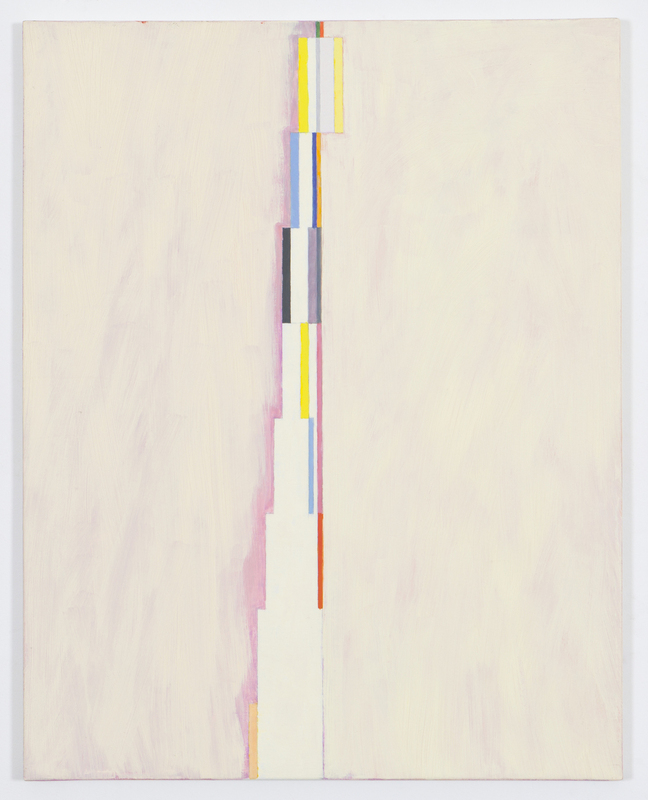 Suspension in More than One Direction (2001) is painted both thickly and more thinly, it involves movements that are sharp and abrupt in places and a white space down the middle that is both the thickest paint and the hardest area to see as anything but a space (as opposed to a thing or a surface.) It’s mood is closer to Deliberate than to any other of the paintings in this group, an intention apparently confirmed by the fact that people who like the one tend to like the other (and none of the rest, which makes it a double-confirmation or perhaps just tells us what they’re looking for.) I don’t do aggressive paintings I do intense paintings, at least by intention. But I could see someone seeing these paintings as aggressive in relation to the rest of the group. I just think they’re kind of burly and straightforward. The Way Birds Use Gravity (2002) is called that because they use it any way they like, without needing to feel limited by it. The title is a play on the word’s meaning in physics and its meaning as a synonym for seriousness. I do not want to feel limited by conventional notions of seriousness. The painting is an example of my being prepared to use anything and everything I can think of to get something done. It has three varieties of metallic leaf under the colors (silver, bronze, and gold,) and uses bare linen in places where elsewhere the surface is complex and developed. 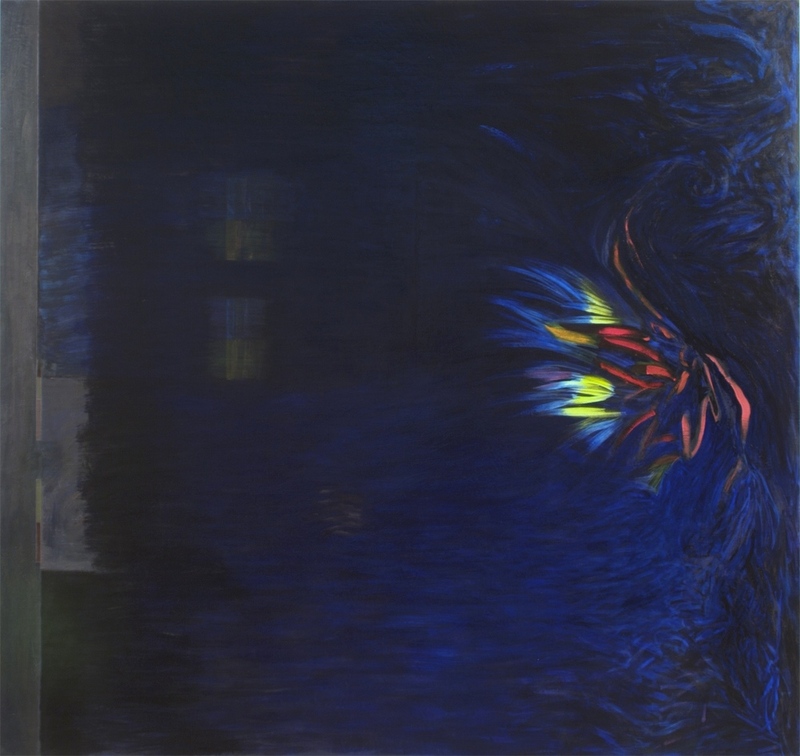 Owl’s Happiness (King of the Wends)(2003) is painted in the colors of the night sky and the ground at night. Owl’s are happiest when it’s dark and they can hunt. Underlying the painting is an image from the northern Crusades that I made up based on the facts: the king of the Wends was said to be able to walk thought a dense forest without breaking a twig. If he did it was bad luck and he and his army would go home. Their enemy was the Teutonic Knights and friends, who couldn’t have been able to move without a significant clanking of armor, and I think the contrast between the two ample material for a painting. The weird shape on the left is based on what was in the sky when Haley’s Comet came around while I was painting this painting, I’d look at it every night when walking the dog. It was a great coincidence, pure movement that still belonged to a shape, seemed made for this work. The Chameleon and the Wraith (2003) is one of the most representational paintings I’ve made since I was in art school hundreds of years ago. Particularly in its use of a direct reference to the lower half of a leg. The title is self-explanatory: a chameleon can turn into the color of its context, maybe become a row of squares; a wraith is by definition elusive and almost transparent, a mass of movements rather than substance. The work is painted pretty thinly with this quality in mind. Step (2004-2005) is called that because it’s based on something a dancer was wearing, and the first step in a dance can be like the first note in music in Deleuze’s example in Difference and Similarity, where he makes the point that the first note doesn’t tell you what the next one’s going to be. The two overlapping garments the dancer wore were silk, and she was Persian and so was the music she danced to, so there was a lot of whirling once it got going, but I wanted to use the colors for a painting which is filled with indeterminate movement like that which tells you a living body is not a corpse, just by looking at it. It is meant to be a painting which is gorgeous, without any thought in it of the brusquely direct sort, only thoughts of the seductively direct sort—which has the advantage of being oxymoronic. 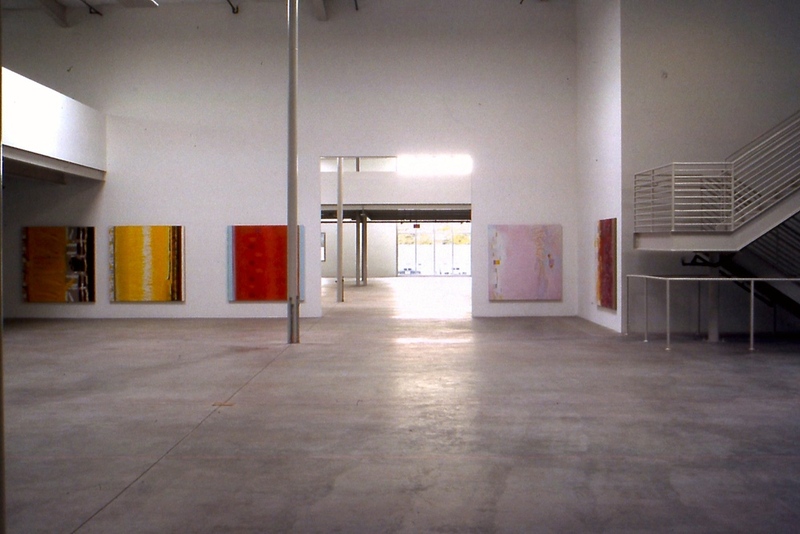 Studio Red (2004) is about a red haze as an interior, flanked by a blue like that of the sky at midday (sort of.) The title refers to Matisse’s Red Studio ( ,) of course, which is also a red interior. Painting is about insides and outsides, when it’s not it still has that pairing as an implication it can only seek to abolish or suspend. I think it works because it’s so thin. 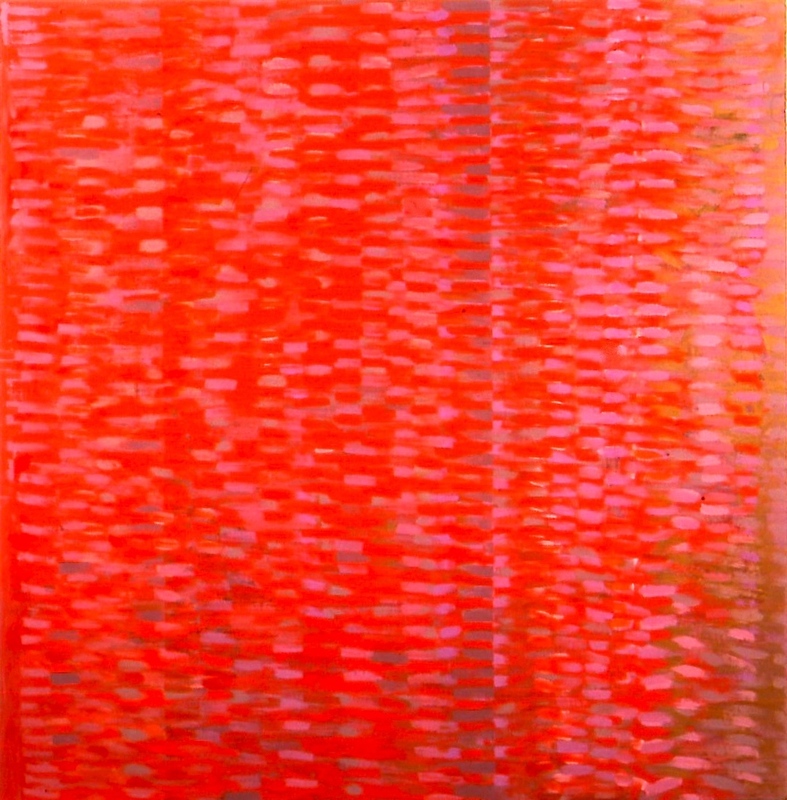 Barbara Rose told me I shouldn’t even show it because it reminded her too much of Rothko I think it was. Likewise, Richard Shiff told me I shouldn’t be referring to Giorgione et al. Both of them may have been right, they are about lots of things after all, but even though they’re also friends I didn’t take their advice. I think it’s best to take the chance of being misunderstood or whatever.